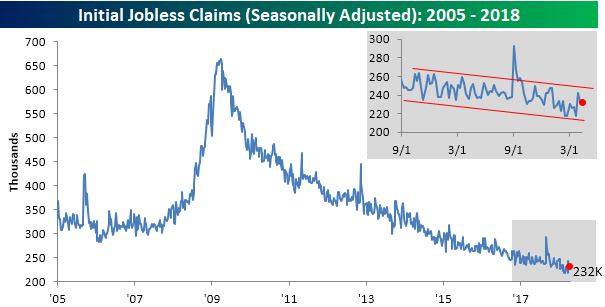 Jobless claims dropped a “whopping” 1K in the latest week and missed expectations by a margin of just 2K. In other words, little changed in the overall trend of claims. For the week, first-time claims came in at 232K. This is the 28th straight week that claims have been at or below 250K, and extends the record of consecutive weeks below 300K to 163. 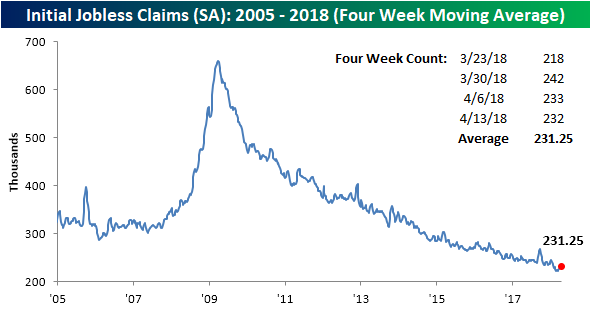 The four-week average for claims rose by just over 1K this week to 231.25K, and remains within 10K of the multi-decade low of 222.75K from early March. 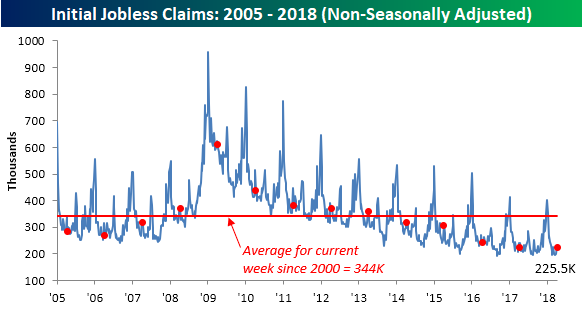 At 225.5K, non-seasonally adjusted claims haven’t been this low in the current week of the calendar since 1973. Going back to 2000, the average for the current week of the year has been 344.3K, so this week’s level is nearly 120K below that.